The fair use doctrine is a limitation on a copyright holder’s exclusive rights to use or protect their copyrighted material. In certain circumstances copyrighted material can be used without acquiring a license and/or permission from the copyright holder. Because the fair use doctrine is an exception to copyright law it is only allowed in some circumstances such as criticism, commentary, news reporting, teaching, scholarship, or research. While the fair use doctrine has been codified or written into law, the ultimate decision on whether a use falls under the fair use doctrine is determined by a judge looking at the facts of the case and balancing the four factors of the fair use doctrine. Purpose and character of the use: Judges are more likely to favor nonprofit educational, noncommercial, or transformative uses as fair. Transformative uses add something new to the work with a further purpose or different character than the original work. Nature of the copyrighted work: Judges favor a factual reporting of the material over using someone’s work for your creative endeavor. In addition, use of an unpublished work is less likely to be considered fair. Amount and significance of use in relation to the copyrighted work as a whole: Judges may look at the size of the portion of material used. However, even use of a small portion can be considered unfair if the portion is considered an important part or the “heart” of the material. Effect of the use upon marketability of copyrighted work: Judges look at whether the unlicensed use may harm the existing or future use of the copyright owner’s original work. Can I use someone’s copyrighted work in my business? The fair use doctrine is meant to foster non-commercial uses such as education, research, and criticism. While you may make a copy for your own personal use, if you would like to use copyrighted material in your business advertising or services it is strongly recommended to contact the copyright owner to discuss licensing or special permissions. Can I limit someone’s fair use rights of my copyrighted work? Case law does allow fair use rights to be contracted away by both freely negotiated contracts and contracts of adhesion (user or buyer agreements). This means when you buy or sell something terms can be added in the contract that limit how a user may use the copyrighted material. There are some legal commentators who believe that by posting something on the internet the copyright holder gives an implied license, however current case law states that intent is necessary for an implied license. 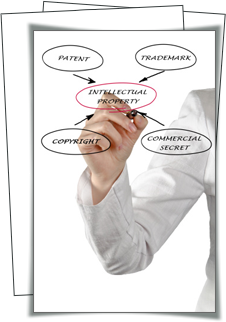 As with any intellectual property, it is important to remember that as the owner of the copyright it is your responsibility to monitor other’s use of your work and inform them of your ownership.